CAMP RUPERTO KANGLEON, Palo, Leyte, Jan 5 (PIA) -- The Police Commissioned Officers (PCOs) of Police Regional Office 8 paid their traditional New Year courtesy call on regional director Arnold Revilla. The annual gathering was attended by the Command Group; Chiefs of the Directorial Staffs; City Directors and Provincial Directors; Battalion Commander of RPSB8; Special Staffs; and Regional Officers, NSUs, PNP-8 Police Community Relations chief Elizar Egloso said. 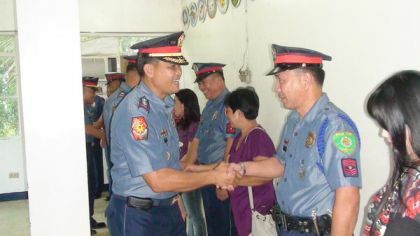 As part of the customs and traditions of the Philippine National Police, the New Year courtesy call is a yearly traditional activity wherein all members of the command group, directorial, and special staffs, provincial and city directors, and other senior officers of regional headquarters pay a call to the regional director. Director Revilla, in his message, commended his men and women in uniform to include non-uniformed personnel for a job well done rendered in the previous year. He also reiterated the PNP philosophy of police day-to-day service, good manners, and right performance of duty, in short "Serbisyong May Pagkukusa." Further, he exhorted the officers and men of PNP-8 to carry on PDG Nicanor Bartolome’s directive to sustain the Integrated Transformation Program where his predecessors put their hearts into. As transformation now focuses on governance, the police will set targets that measure reform programs through a roadmap and a score card. He added that he has ordered his men to do a periodic performance audit to determine who are at par with the job and was fall short of the expected work results. “We will place the right people on the right job,” Revilla said. Moreover, he will continuously develop competencies, to enhance individual skills, to specialize, thus giving premium to investigation, resource management and even disaster response, among others.